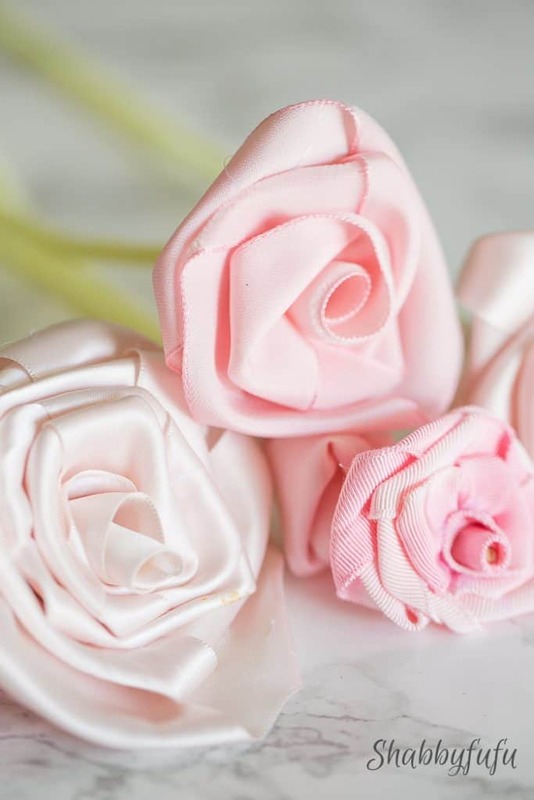 No sew easy diy ribbon roses simplified! 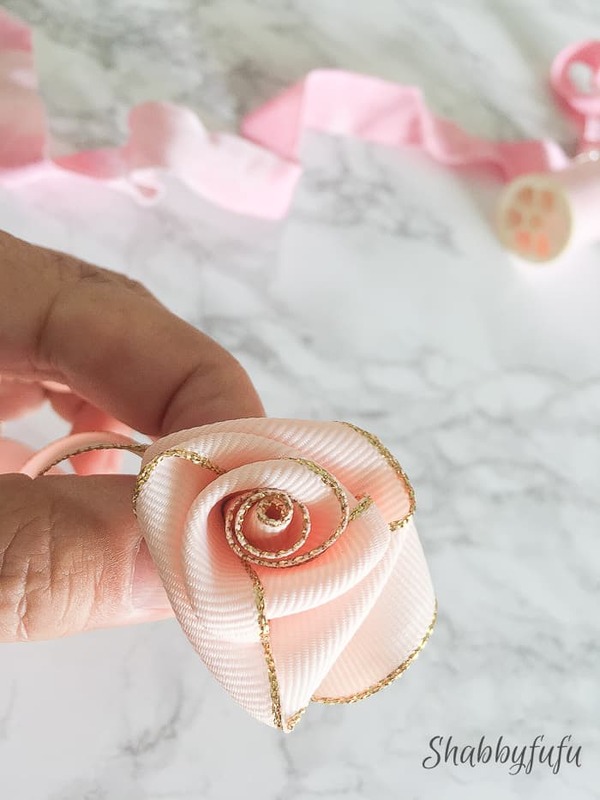 I have been making ribbon rose flowers for a long time and it’s just one of those things that you do by hand that is therapeutic and relaxing. Ribbon rosettes can be used to adorn so many things or as I have done today you can simply create pretty ribbon long stemmed flowers. 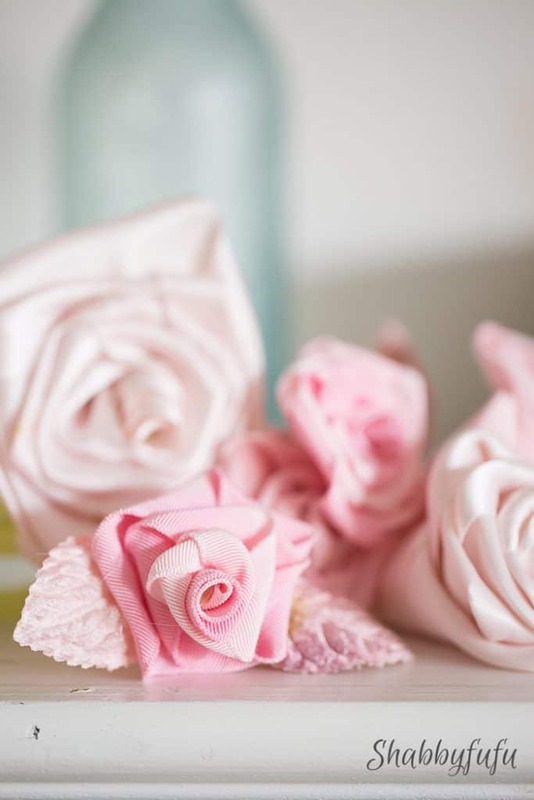 These no sew easy diy ribbon roses are nostalgic and romantic! Cut a length of ribbon about a yard long. You don’t have to measure, just hold the ribbon in your hand and bring it up to your collarbone. That is a yard, just in case you didn’t know ;-). Take the ribbon and fold it down the way that I’ve shown in the photo above. You can either use a T-PIN to hold it in place that will be pulled out later, or dab a bit of hot glue into the fold and press down to adhere. 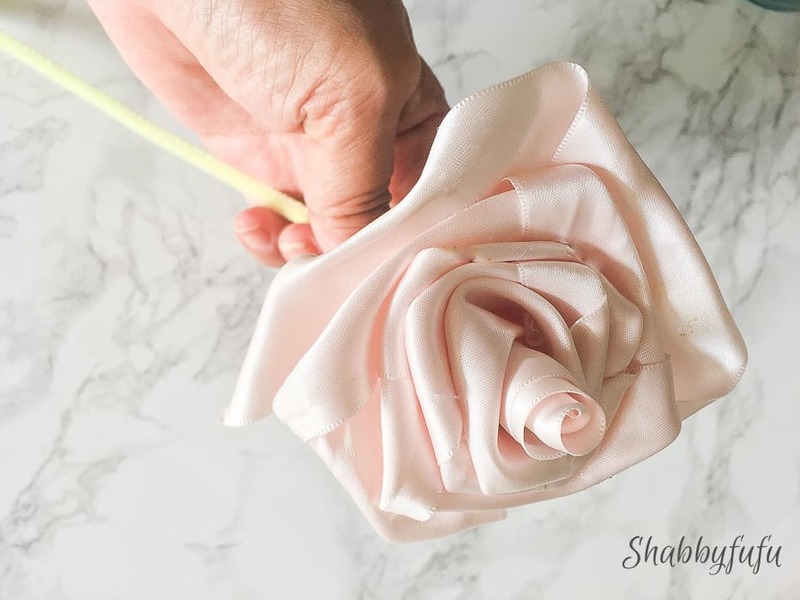 By the way, if you want the ribbon roses for clothing or something that needs to be washed, I would suggest using a needle and thread and just do a couple of tack stitches every once in awhile. 2. Now begin rolling the ribbon and do it somewhat tightly at first. As you progress with the rolling you can loosen up the grip. The center is going to look like the center of a rose, so think about how a rose in nature unfurls. 3. 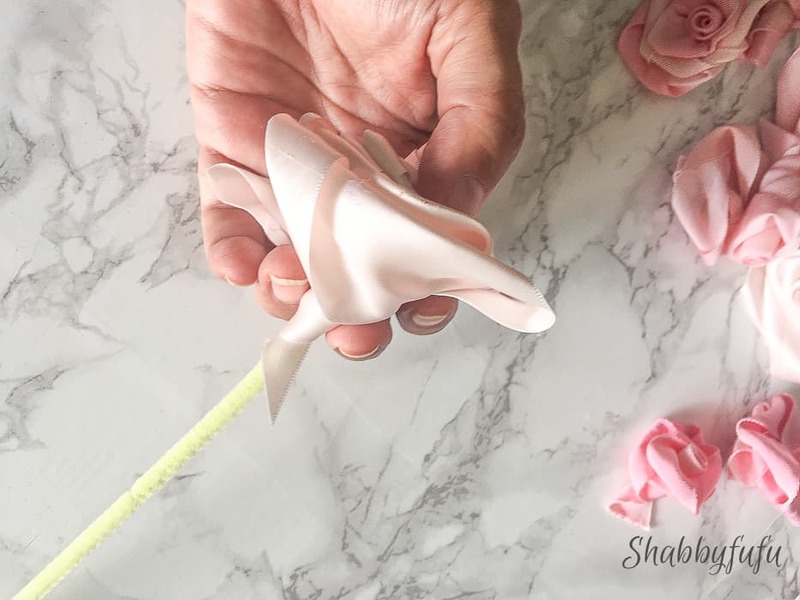 As you move along turning your ribbon you’ll want to fold it over every other turn or so to form the folds of the rose. 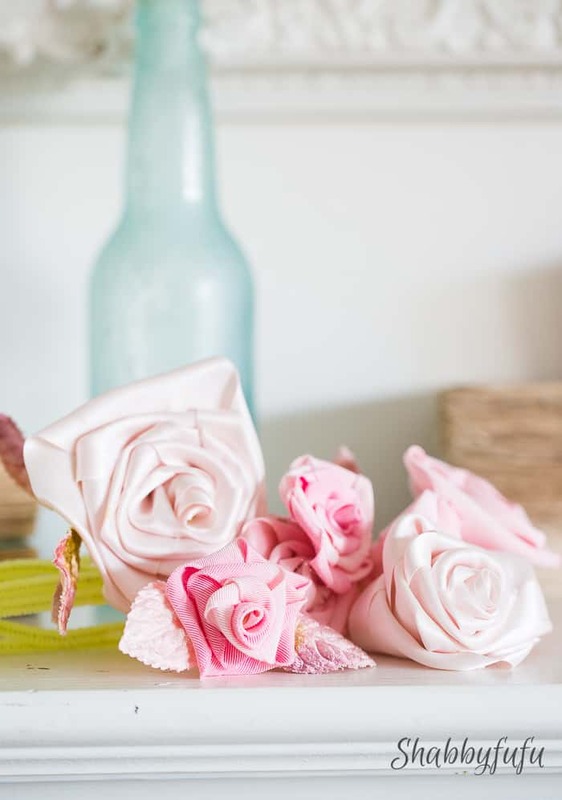 No stress if it’s not perfect on these no sew easy diy ribbon roses. Practice makes it perfect, or at least easier. You can buy them or make them and I prefer to make my own and have them just as I envision. 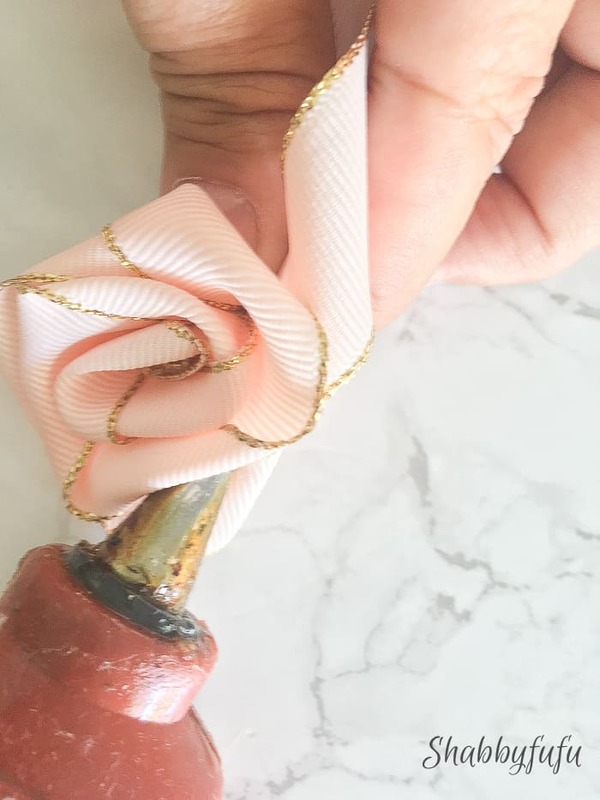 Here is my own no sew easy diy ribbon rose as it nears completion. 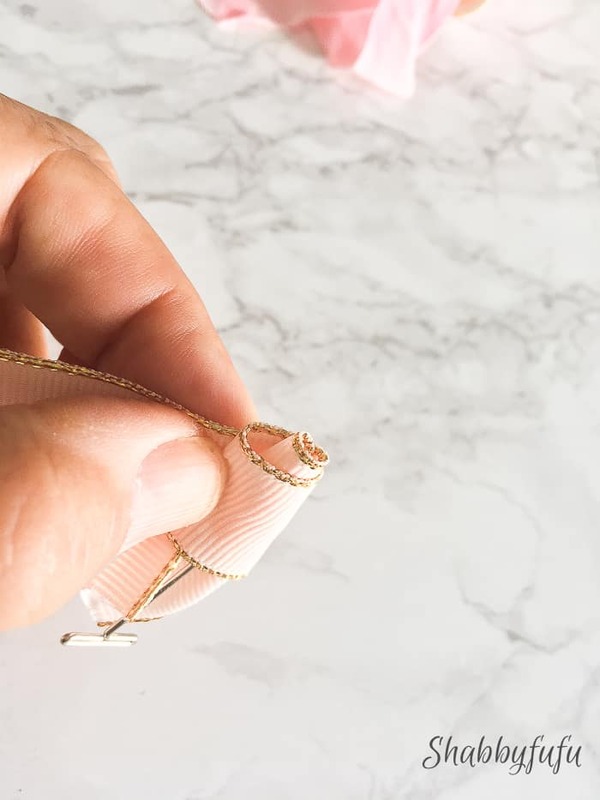 It’s helpful to use a dab of hot glue on the backside in the folds of the ribbon every few turns to hold the ribbon in place. If tacking with a needle and thread is easier for you, then by all means do it that way. 4. 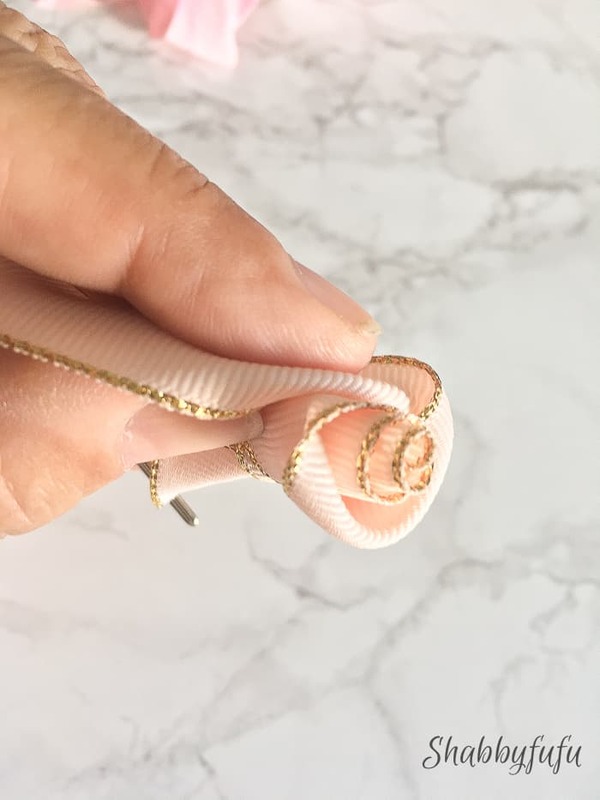 Hot glue the RIBBON ROSE when you feel that it is complete at the very last turn on the backside, then pull out your T-Pin and cut off any excess ribbon that remains. 5. If you choose to make flowers to place in a vase then grab a chenille pipe cleaner (I always keep a stash in my craft studio:-) and push it up inside the center roll with a dab of hot glue. These would be lovely for a BRIDAL BOUQUET, and I’ve used RIBBON FLOWERS to make necklaces, adorn lampshades, clothing and more. 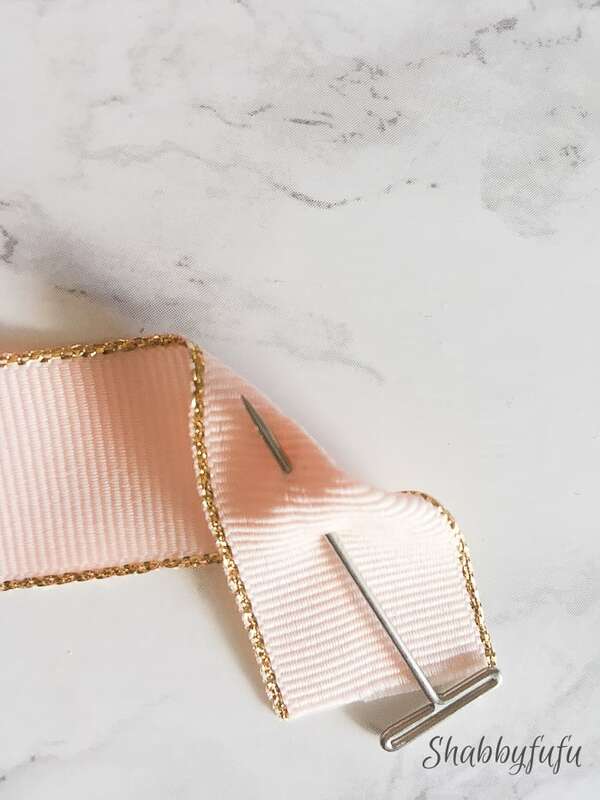 I wouldn’t say that ribbon roses are necessarily on trend, but I use what I like and I think that these are pretty and soft in any setting…even just laying down. This is an older shot from something that I did for Country Living Magazine, and you can use torn fabric strips as well to make rolled ribbon roses. 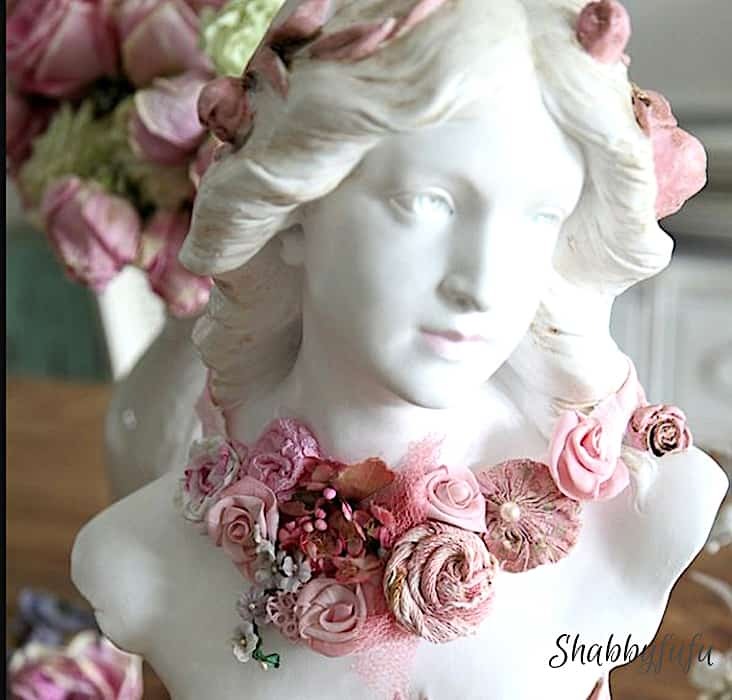 I added vintage velvet millinery leaves to a few of the roses by hot gluing to the back. 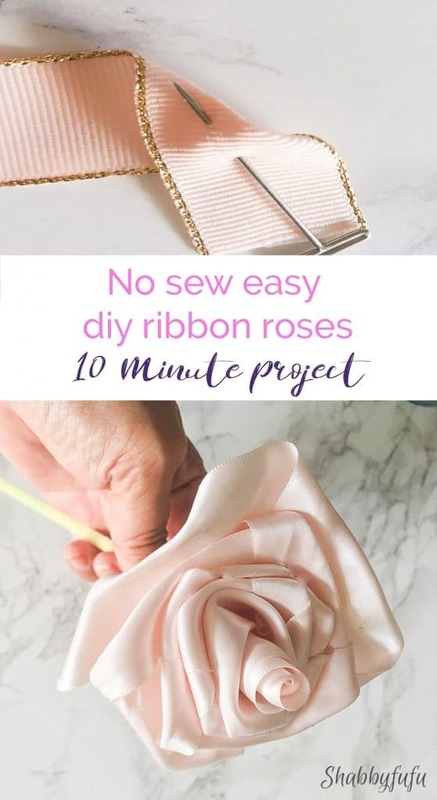 And there you have it and they truly ARE simple and the easiest no sew easy diy ribbon roses to create! I hope that you enjoyed this DIY and let me know if you have any questions! 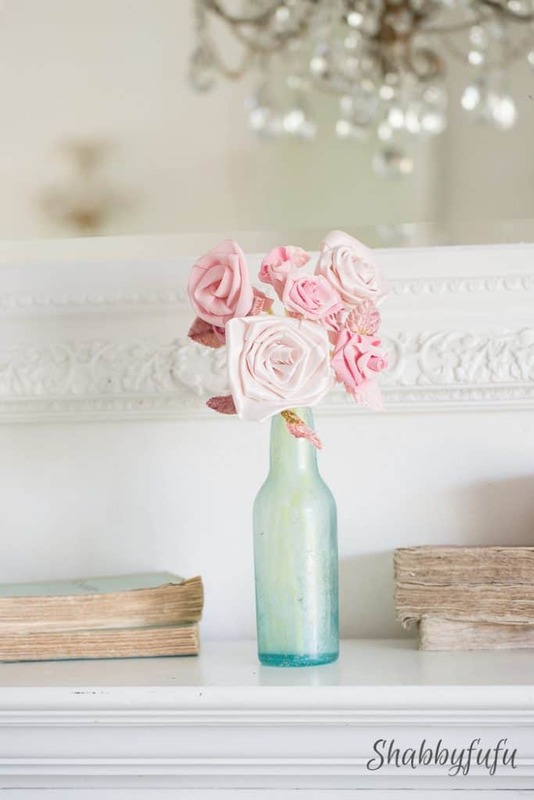 Love all your floral styling!! So beautiful! Fall is one of my favorite seasons to decorate! Thank you for sharing!! FUN project… saved and ready to share with friends. Thanks Linda for stopping by and checking out the posts today. Enjoy your week! Thank you! I can’t wait to get all the ribbon out that I have saved from packages that I have ordered. It’s so satisfying and loads of fun!